[description] => All painting of Music. [category_description] => All painting of Music. Many years ago, sometime before the paleolithic period, my mother (who is now 91 years of age) knitted me two pairs of finger-less mitts. She used left over bits of wool to produce two identical pairs which sported elongated cuffs to keep out the draughts around the wrists. There is an old saying used when confronted with a less than attractive face, “There’s a face only a mother could love.” Well, one might say there are some gloves that only a son could love! But love them I have. Sadly one pair disappeared many years ago but my current pair have served me well…keeping my hands warm throughout numerous winters..particularly in my studio. My studio is in an old cotton mill and on days like today one can see one’s breath and the mitts have been doing their job. Over the last couple of years the wool has become so unravelled that I have had to regularly trim the straggly strands. Today, not for the first time, some errant straggly bits picked up oil paint either from my palette or other areas of my painting and then deposited paint elsewhere across the painting. These areas had to be repainted as there were spidery smears across freshly finished parts of the canvas! Alas it is clearly time to say goodbye to these old friends and replace them with less “unique” factory knitted finger-less mitts. I almost feel that I should place the old faithfuls in an old shoe box, set fire to them (this would be extremely easy as they are soaked in oil paint and turpentine) and push them out across the little reservoir at foot of my garden…Viking burial style! 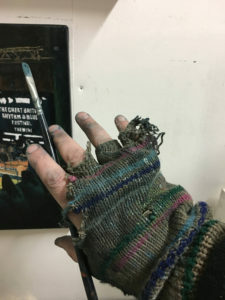 I’ll be back at the studio tomorrow with intact finger-less mitts….but somehow the experience of pulling on the factory made ones won’t quite have the same romance as my Mom’s home-made multi-coloured, long cuffed old mitts.